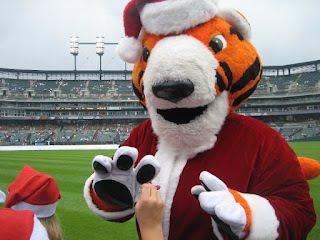 Tomorrow from 11 a.m. – 1 p.m., everyone’s favorite fuzzy mascot, PAWS, will cheer on not just the Detroit Tigers, but The Salvation Army of Metro Detroit. Army’s Red Kettle Campaign. The public is welcome to come out, meet and take photos with PAWS, donate to his Red Kettle and help The Salvation Army reach its $7.8 million goal to help those in need right here in metro Detroit. Macy’s at Twelve Oaks is located at 27550 Novi Rd. PAWS will be at the main entrance of Macy’s (outside) facing Novi Rd. For more information about The Salvation Army, call 877-SAL-MICH or visit www.salmich.org.